Few know so many friends alive as dead." This is fascinating. 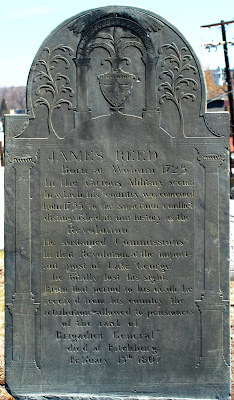 That stone is almost an exact duplicate of the 1807 stone of Gen. James Reed in Fitchburg. It shows how the workshops followed particular templates at particular times, and yet varied the details (not merely the inscription). These stones are certainly from the Dwight workshop in Shirley, and this Concord stone (unlike the Reed stone) happens to preserve the border of "Dwight drops" along the tympanum that was characteristic of John Dwight's work many years before, even though most of the rest of the style has changed. There are a few minor design elements that appear here and reappear in other Dwight stones in different sizes or arrangements also. Is this stone in the Concord center cemetery along the ridge? This was clearly the template for the Dwight "luxury model" of circa 1806 -- the Reed stone is at least 5' tall. Interestingly, it was originally in South Street Cemetery, Fitchburg's oldest, but at some point it was moved to the newer Laurel Hill Cemetery a few blocks away, where it stands in perfect condition today. I'll email a photo to you and you can post it here for comparison purposes if you like. The lettering style is identical also: very good in the individual letterforms, but awkward in its centering. Thanks for the great connection! Yes, this stone is in the graveyard in the center of Concord. If I remember correctly, it is over the crest of the hill and down toward the back, near the John Jack stone. The Farber collection is an absolutely extraordinary resource and having it online is invaluable, but it's a pain the neck to use. Having said that, I'd also be the first to recognize that when it was put online in the early days of the web, it was years ahead of its time in accessibility. It's just that the web has advanced, and the old heavy interface of the Farber collection is still in place. Someone needs to apply for a grant to build a new database underneath it and a new interface on top of it. On this little collection of matching stones: it's fascinating to see that while the carver was obviously working from a pattern, it can't have been something like a drawn sheet of paper with a design that was traced onto multiple stones, because nearly every detail on the stones is different. If you compare the stylized trees on the 1806 Jones and 1807 Reed stones, for example, at a glance they look the same but in fact they are not: no two of them are the same, each having been drawn uniquely. Likewise the columns are similar, but they were clearly original creations for each particular stone. So what did the carver have in hand? It must have been a small sketch of a general pattern, and then in preparing each stone he realized the details of that pattern uniquely, drawing each element as if it were for the first time. One element that's on your Concord stone but not on the Reed stone is the little compass-drawn six-pointed fleuron at the top. Although that doesn't appear on the Reed stone, it does appear often on other large Dwight stones from the same period, linking them into this whole family of designs.